Found one file extension association related to Sam and Max Complete Collection and 1 file format developed specifically for use with Sam and Max Complete Collection. 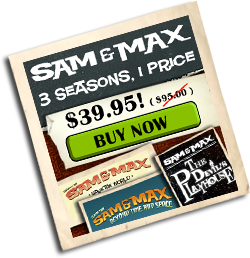 Sam & Max Complete Collection contains Save the World, Beyond Time and Space and The Devil's Playhouse adventure games with popular pet detectives. If you need more information please contact the developers of Sam and Max Complete Collection (Telltale Games), or check out their product website.